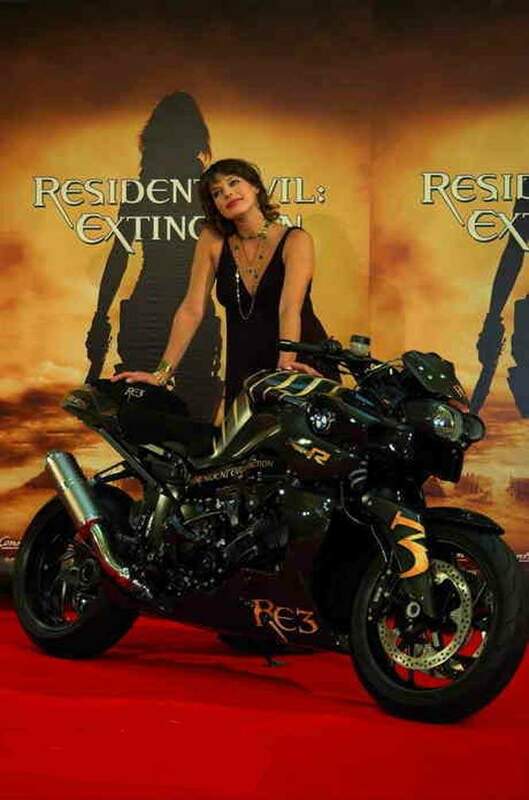 Hollywood actress Milla Jovovich was paired with a very special BMW K 1200 R in Munich following an advanced press screening of the "Resident Evil: Extinction" movie. Thirty-one year-old Jovovich was in Germany to promote the latest instalment in the best-selling Resident Evil movie franchise, based on the gaming phenomenon of the same name. 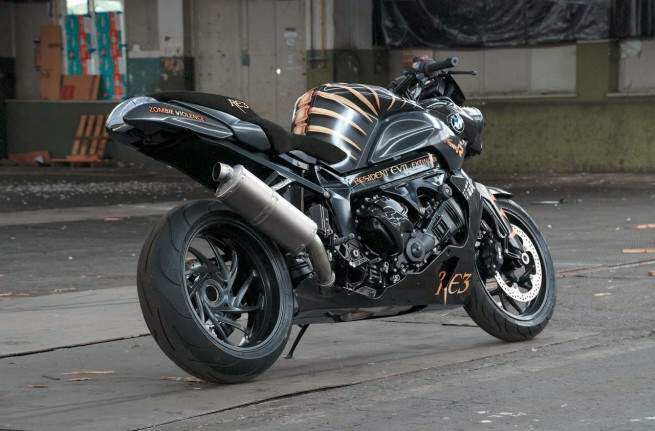 Jovovich’s character, Alice, rides a BMW K 1200 R in the film. 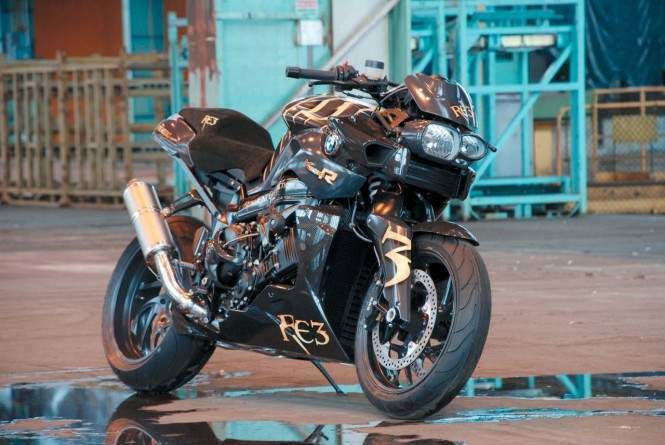 Milla Jovovich, borne in the Ukrainia, commenting the BMW Motorrad, that is based on the 163 horsepower four-cylinder K 1200 R - currently the most powerful production naked roadster in the world - "I’m not the best judge but I’ve had a few guy friends freak out over it and say that the bones [design] are awesome. It looks great." 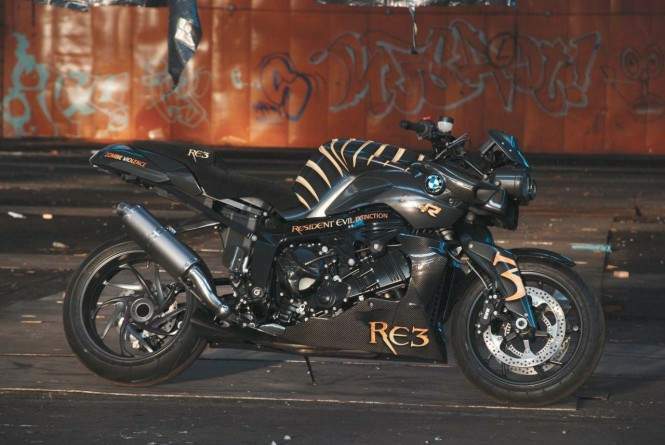 Created by talented artist Georg Huber to commemorate the BMW K 1200 R’s starring role in the new action blockbuster, the ’RE3’ show bike features immaculately airbrushed spinal bones on the tank and detailed gold lettering on the fairing to tie in with the theme of the action movie, which takes off where Resident Evil: Apocalypse left off. Jovovich has starred in many films, including futuristic, action thriller Ultraviolet; Sir Richard Attenborough’s Chaplin; Luc Besson’s The Fifth Element; and Spike Lee’s He Got Game. Commenting on the "Resident Evil: Extinction" movie, Jovovich is proud of the work she has done on the third film in this trilogy: "It was a lot of fun making it - these films have been a great experience for me. I guess I feel like I can do a lot of different parts but action I really love. I love training and working with weapons; it’s a lot of fun but takes a lot of focus. I get to recreate this character and it’s been a great opportunity for me - not many actors can say they have a 3 DVD box-set."